Disclaimer: This is a sponsored post. Although the thoughts and sentiments contained in the post are my own, I received complementary product and financial compensation from the sponsor of the post, Raised Real. Our baby twins Gus & Hannah recently started eating solid foods - bringing the total to 7 kids currently sitting at our table. With 2 more hungry babies to feed, I’m always on the lookout for convenient, healthy family meal ideas…which is why I was excited to try Raised Real. Raised real is a home delivered baby food subscription service. The way Raised Real works is 20 flash frozen, organically-sourced baby-read meals arrive on your door step every two weeks. I love home delivered meal prep services, and I’m so glad someone finally invented one for babies! The Raised Real meals take just minutes to prepare and you can serve as finger foods, mash or puree as you wish. As a dietitian I’m always interested in the quality of food that I feed my kids. I like that the Raised Real meals feature a variety of fruits, grains and vegetables, plus an added fat which is important for baby brain development. The flavor combinations and profiles are also unique and the Raised Real approach supports what I teach in my baby-led weaning courses and materials (and what current research also confirms) - that the greater the number of foods, flavors and tastes we can expose our babies to in the earlier days of eating, the more likely we are to raise eager eaters and help prevent picky eating. The Raised Real meals came together on the stovetop in about 5 minutes. The first one I prepped for Gus & Hannah was Cauliflower + Kale with quinoa, garlic, and avocado oil. We do baby-led weaning and I’m a huge proponent of baby self-feeding. I liked the avocado oil as an added fat, but kale and quinoa were 2 foods the twins hadn’t tried yet in their first 3 weeks with solid food. They are only about 7 months old at the time of this writing (6.5 months adjusted) so they don’t have their pincer grasp yet. Foods like chopped up kale and tiny quinoa grains are hard to eat, so it was a great combo food for them to use to practice their spoon skills. Even though we do baby-led weaning, I still incorporate spoons by pre-loading the baby spoon and letting Gus & Hannah self-feed using the food on the spoon. 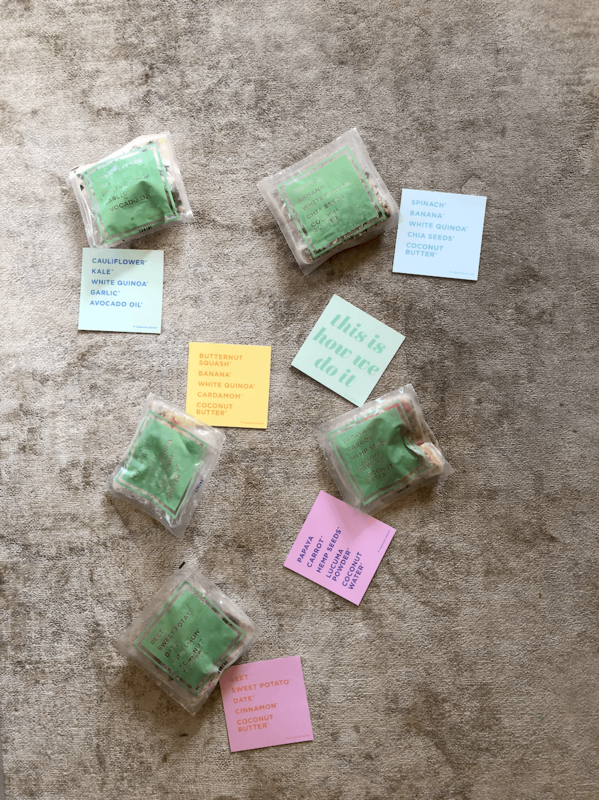 Both of the babies seemed to really enjoyed the Raised Real meals, and I loved how convenient it was to prep…not to mention the super clean ingredient list. I try all of the foods that I serve my babies and I have to say I was pleasantly surprised by how tasty the Raised Real meals were. I followed the instructions to cook on the stovetop for 5-6 minutes and the finished texture was perfect and the flavors were very subtle but distinct. If you want to check out Raised Real for your baby, click here to get started and enter code KATIEF25 for $25 off your first box of Raised Real baby food. Thank you to Raised Real for providing samples of their product to try and for sponsoring this post. To learn more about Raised Real, visit their website at www.raisedreal.com.